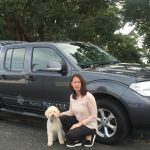 My name is Brenda Lupton and I really enjoy keeping pets and their families together, whether they are traveling around the globe or to another location within New Zealand. I understand that moving you and your family to another county or town can be very stressful and to know that your pet is being well looked after and all the details are taken care of for you can help make this process less stressful for you. Ihave been a Foster volunteer for the SPCA for over 20 years and still foster’s kittens to this day, in addition to looking after her own cat Seb. I also have an Agility dog called Molly and compete in Agility Competitions around the upper North Island. Along with my husband Tony, we teach 6 week block courses for Social Obedience training for the Akarana Dog Club. This has given us a lot of experience in handling a huge variety of different types of dogs all with diverse temperaments. Please read some of our customer reviews or contact us to find out more.